As far as railways and research goes, the CVLR ranks fairly well in terms of the amount of material and data available. 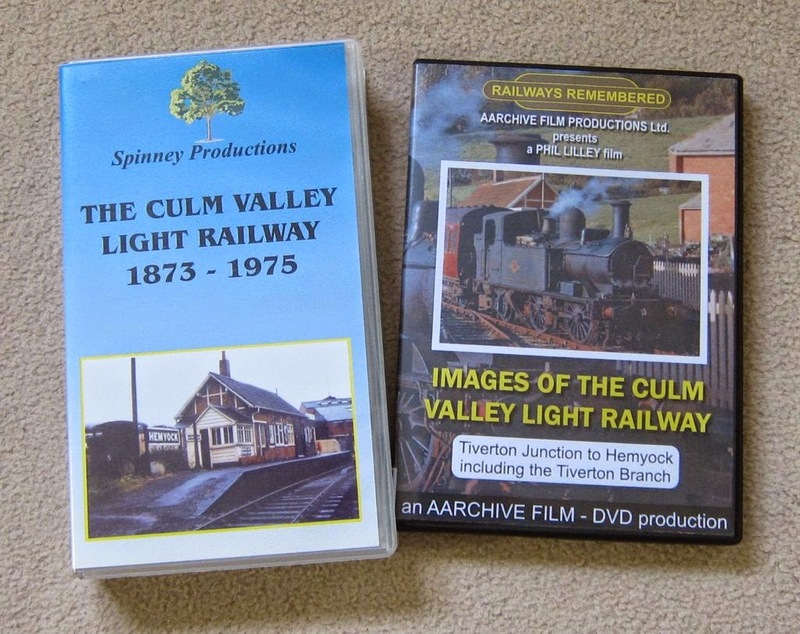 Books, magazines, a video, a DVD and countless photographs on the internet all serve to conjure up wonderful images of this little railway and its environs. It is entirely possible to work backwards from the departure of that very last train from Hemyock on the Blackdown Archives site all the way back to 1882 on John Spellers web pages without ever having to move from the PC. It has to be said though, I find studying a photo in a magazine or book a much more pleasant activity than spending yet more time in front of a computer. 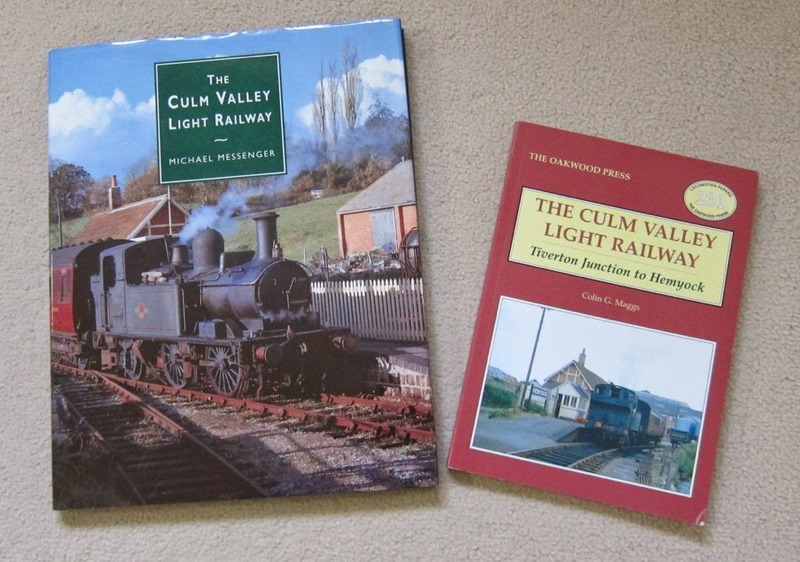 The two main books on the branch, both titled The Culm Valley Light Railway, one by Michael Messenger / Twelveheads Press and the other by Colin Maggs / The Oakwood Press are well worth the cost for anybody interested in the history and development of the line. Both the video and the DVD contain archive footage shot on 8mm film, the latter contains footage from a Mr Arthur Harris, shot in colour from1962 and shows tantalising snippets of various parts of the line as he travelled along it. I'd like to be able to watch the video again as I recall it containing different information to the DVD, alas, it has been sometime since I owned a video player! I keep a copy in the hope that I will bump into someone who hasn't upgraded to DVD like the rest of us. Magazine wise, they can be split into the contemporary scene as it was (ie up to the 1975 line closure) and the reminiscent (ie post closure). The Railway Magazine, February 1936. 5 present day photos and a short description of the history of the line. There is a part two to this article that I haven't been able to source yet. The Railway World, February 1953. 2 page short history with a photo of No1300 at Uffculme 1882. Railway World, November 1962. 6 photos and a description of the line. The Culm Valley Light Railway pamphlet, 1964. Railway World, March 1976. A memoir of the line with 5 photos. *Railway Magazine, March 1987. Boyhood recollection of the line and some of its characters, 4 photos and utterly wonderful. *Steam Days, April-June 1990. Ride the Culm Valley Mixed Train - 18 photos, heading out and back, with a wealth of detail. A wonderful colour shot of 1421 and an Ex_ER coach at Culmstock to finish off. *Great Western Railway Journal, No 5 Winter 1993. Two lovely double page spreads of Hemyock station in the early 1930's plus a half page shot of the dairy c1900-1910. Steam World, No 75 September 1993. A brief mention of the CVLR in an article about a camping coach holiday, supported with 6 photos of the line (3 in colour). *Steam World, No 82 April 94. A double page spread with five colour photos of the line in the 1960-63 period. Steam World, No96 June 1995. Three page article on the Barry Coaches on the line, 6 photos (3 colour). *Backtrack, Vol 16 No1 Jan 2002. Three pages with 7 colour photos of the line, again from the early 60's. *Railway Bylines, Vol 8 No7 June 2003. Peter Barnfield describes a wet day out on the Hemyock branch, supported with 12 quite wonderful b&w photos. As expected, some of the photos have been shared between books and articles meaning there will be a chance of repeats with any purchase. Its not a bad thing though, sometimes you notice something different on a second (or indeed third or fourth) look...and the CVLR is difficult to tire of in my opinion. If I was collecting again, I'd just plumb for those magazines noted with a *, the colour shots and stories are the most applicable to my interest and cover a good selection of the available pool of photos. Other books feature photos and notes about the line, Great Western Branch Lines by Soggee & Welch has four pages with colour photos whilst Great Western Branch Termini (Vol2 or combined edition) has 24 pages of photos and text describing Hemyock station through the ages. Drawings for the station building and goods shed at Hemyock can be found in British Railway Journals No 1 and No3 in articles titled Common Light Railway Architecture by Paul Karau. I am doing a version of the CVLR at Hemyock in S7 and find your blog of interest. I was wondering if you know of any pictures of the interior of the Hemyock station building? The outside is well documented but I cannot seem to find any interior shots. I've not found any photos of the inside of the Hemyock station building either I'm afraid. Its a good question - it would be nice to talk to somebody who had actually been inside it to get some ideas on what it was like. I wonder if somebody like Peter Barnfield who wrote some of the articles referenced can remember any details...something for both of us to explore!